The Cleveland Cavaliers finally decided they had seen enough of the enigma that is J.J. Hickson, trading the third-year forward/center to Sacramento for small forward Omri Casspi. The Cavs also receive a lottery-protected first round pick from the Kings as the team works to rebuild the franchise and stockpile draft picks. The first round is lottery-protected in 2012, then is protected in 2013 if it is one of the first 13 picks, 2014 (1-12) and 2015-2017 (1-10). If the pick is not sent to the Cavs by 2017, then Sacramento will convey its own 2017 second round draft pick to the Cavaliers. Stat wise, the deal appears to be a wash. In three seasons with the Cavs, Hickson averaged 20.9 minutes a game, 9.1 points and 5.7 rebounds. In two seasons with the Kings, Casspi averaged 24.5 minutes, 9.5 points and 4.4 rebounds. Both players are 67 percent free-throw shooters, but Casspi is a better outside shooter. Casspi fills a need on the Cavs, and moving Hickson alleviates the logjam the Cavs had at power forward after drafting Tristan Thompson. 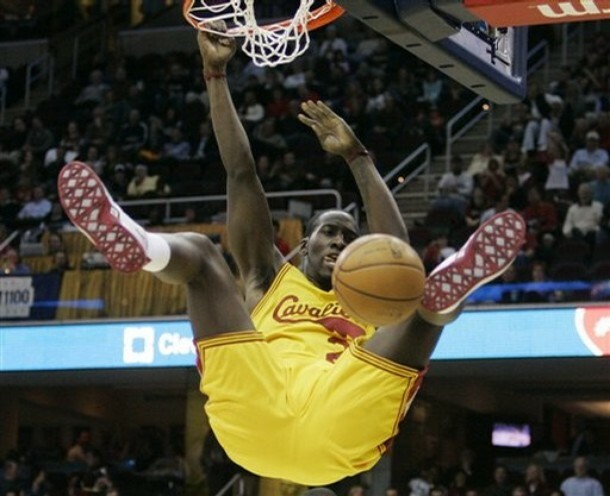 As for Hickson, he was one of those divisive players that we always seem to have here in Cleveland. He showed just enough talent at times to make some fans think he was the second coming of Larry Nance, but was inconsistent enough to make just as many fans crazy. And it became clear last season that Byron Scott was frustrated with him. That right there sums up Hickson: in three years he just wasn’t able to focus and take things seriously enough through two coaches with two different systems. Clearly the Cavs were tired of waiting for him to figure it out. Do they run the risk of Hickson turning into a superstar? Maybe, but the gamble is worth the risk. If all Thompson does is show up every game prepared to do his job, and Casspi can be a decent player, the team will have come out of this deal OK.
As for the Cleveland Indians, they have to be glad that June has finally come to a close. The Tribe ended May in first place by five games over Detroit with a record of 32-20. After a dismal 10-17 record in June, the Wahoos find themselves in second place, a half-game behind the Tigers. The last time they were this close to first place heading into July was 2007, when they finished June in first place by 1.5 games. One thing that is keeping us up at night about the Indians, other than the offense, is the workload of starting pitchers Josh Tomlin, Carlos Carrasco and Justin Masterson. As the Indians stay in the pennant race, they are going to rely more and more on the trio, which have been the team’s best starting pitchers in the first half of the season. But what’s going to happen in August and September when the innings start to pile up? Tomlin has thrown 102.2 innings in 16 starts this year; he only pitched 73 innings on the big-league level last year. Carrasco, with 94 innings, has already pitched more innings than 2010 (44.2) and 2009 (22.1) combined. We are a little less worried about Masterson, who has 105.2 innings pitched in 16 starts. He threw 129.1 innings in 2009 and 180 innings last year, but he is still on pace for a career high. If one or more of these three come down with a dead arm later in the season, the Tribe could really be in trouble. Don't forget to include minor league innings pitched in there as Carrasco actually pitched 194 2/3 innings last year between Columbus and Cleveland while Tomlin threw 180 1/3 innings in 2010 in AAA and MLB. None of these guys is going to go soaring over 200 or 225 IP, but innings pitched in the Minors still are innings pitched. True. I would say pitching on the big league level is a little more taxing, but you're right.